Effects of Agrochemicals on Ants – Just the Tip of the Ant Mound? We are a pair of undergraduate students working on our dissertation project in the Sumner Lab. For our project we decided to study the effects that agrochemicals can have on two native UK ant species. Non-target organisms can often become victims of exposure to agricultural chemicals, with the most studied example being the common honeybee (Apis mellifera) . Very little published research is currently available on the effects of agrochemicals on other non-target species . Ants play a vital role in many ecosystems and strongly influence the abundance and diversity of other species. They modify their external environment and are often both ecosystem engineers and keystone species . Therefore, any adverse behavioural effects as a result of agrochemical exposure may have impacts not only on affected ants, but also on other commensal species. Our work is an attempt to address this issue and begin to fill in this significant knowledge gap. The two ant species selected for our study were Lasius niger (common black garden ant) and Lasius flavus (yellow meadow ant). Both species are sympatric competitors and have distinct, yet overlapping niche preferences. L. flavus is submissive and almost entirely aphid-tending, whereas L. niger is more dominant and occasionally preys on L. flavus . The competition and ecological differences between both species make them an ideal model for evaluating the effects of agrochemicals on interacting species. We collected worker ants from multiple locations in the Bristol area. To determine the effect of an agricultural chemical, testing was split into three crucial components: agrochemical tolerance, interspecies interactions, and foraging behaviour. We predicted that both species would show lower aggression when exposed to a sub-lethal agrochemical dose. Based on honeybee studies, we also predicted that foraging ability would become impaired as a result of exposure. To test chemical tolerance an oral dose LD50 was performed. Individual ants were given various concentrations of the agrochemical and left for 96 hours. Checks on the ants were made at 24 hour intervals after initial exposure and the number of deceased ants were counted. From this data we calculated the dose of the chemical required to kill an average of 50% of individuals within the population. 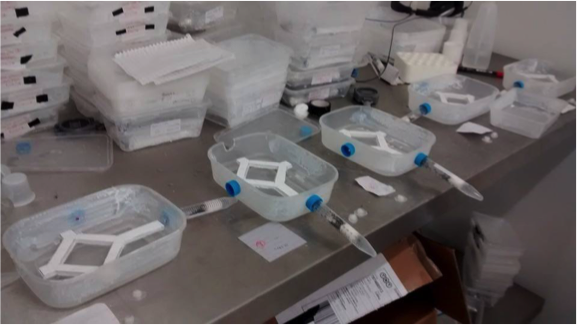 The values we calculated from this experiment showed that the levels of the agrochemical within the UK environment are unlikely to result in the death of L. niger or L. flavus individuals over 96 hours. Testing interspecies interactions was done using colonies that were either exposed to a sub-lethal dose or given a control treatment. 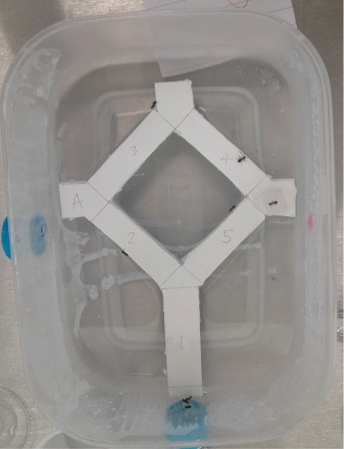 One-on-one ant fights were observed for all possible combinations of exposed and non-exposed ants with 30 replicates per combination. Behaviour was classified as either aggressive or non-aggressive. Foraging behaviour was studied using a simple maze design (fig.1, fig.2). This design contained one food source and several marked sections along which the walking speeds of ants could be recorded. To measure activity rate, we took photos to count the number of ants present on the maze at each minute. Figure 1. The maze design used in the foraging ability experiments. Sugar solution was placed at either point ‘a’ or ‘b’ on the maze. The 5cm sections were used to measure walking speed. A photograph of the maze was taken each minute for 60 minutes to count the number of ants present. Figure 2. Six mazes were observed at a time and recordings were staggered. The orientation of each maze was randomly changed to minimise potential biases. Our experiments demonstrate that agrochemicals at concentrations found within UK arable soils could potentially affect the behaviour of both species under investigation. This could result in a tilting in the balance of competition between these two species , which may have unforeseen consequences on the fitness of colonies and commensal species (such as aphids). The results of this study are surely only the tip of the ant mound and, clearly, much more research is required for us to truly understand the effects of agrochemicals on our environment. Blacquiere, T., Smagghe, G., van Gestel, C. A. M. & Mommaerts, V. (2012). Neonicotinoids in bees: a review on concentrations, side-effects and risk assessment. Ecotoxicology, 21(4), 973-992. Goulson, D. (2013). An overview of the environmental risks posed by neonicotinoid insecticides. Journal of Applied Ecology, 50(4), 977-987. Folgarait, J. (1998) Ant biodiversity and its relationship to ecosystem functioning: a review. Biodiversity and Conservation, 7(9), 1221-1244. Dauber, J., Schroeter, D. & Wolters, V. (2001). Species specific effects of ants on microbial activity and N-availability in the soil of an old-field. European Journal of Soil Biology, 37(4), 259-261. Pontin, J. (1961). Population stabilization and competition between the ants Lasius flavus (F.) and L. niger (L.). Journal of Animal Ecology, 30(1), 47-54.